All too often kids are pushed aside and labeled as troubled, disobedient, or lazy. Schools are supposed to be inclusive and meet the needs of every child, yet there are still those that do not feel that school is a home for them. “Included" or “wanted” are not words they would use to describe their feelings about school. I was one of those kids that could not see the need for core curriculum! As a matter of fact I found no need for school at all in my early years. I constantly found myself asking “Where will I use any of this?” Career and Technical Education was and still is the piece of the puzzle that brings education together for me and millions of other children every single day. Career and Technical Education, specifically Automotive Technology, has saved my life several times over! In high school I thought I knew everything. I was bound and determined to drop out or get kicked out. I would regularly pretend that I was my best friend Eric’s father and call him out while he would do the same for me. When we skipped class it was so that we could work on cars. My counselor told me I wasn’t “college material” and needed to learn a trade. She directed me to the local Technology Center (DAVEA) where I was able to focus on automotive for several hours a day. It was there that I found my home and met my mentor who understood my struggles; with his support and constant guidance I turned things around and still continue to accomplish my dreams. The connections that we are able to make as teachers are imperative to student learning. Every kid that walks through the school house door brings baggage: from the night before, week before, or a lifetime of let downs. One teacher won't connect with every kid, but it is imperative that we try. For me that teacher was Jim Krudl. He looked past the terrible grades, poor attendance, and attitude and was able to see something in me that no one else could! He saw me as a young man with a passion for cars and one with impeccable work ethic if it was important to me. He gave meaning to the classes that I had once thought were useless by connecting it to something I loved. He infused core curriculum in every lesson. Career in Technical Education combines high motivation for learning with a skill that can be applied to a career or post-secondary education. Incorporated into every lesson and skill is the core curriculum students need. CTE strengthens and supports the understanding of fundamental tasks. I often call it teaching by trickery. I will lay out a camshaft or a turbo charger, the kids know what it is and they come in touching it and talking about it before I even begin the lesson. Then we begin talking lift and duration and before they know it each of them are using math! Every kid can benefit from a CTE class, as they are going to want a career, and most careers now require some technical proficiency. I tell my students this is the last time in your life that you will receive a skill that you can use to support yourself and your family for free. After you walk out of high school every bit of that education will cost you. As a nation we’re at the precipice of a new age: teachers not only having a seat at the table but teachers setting the table with Teacher Leadership, support of early childhood education, and Career and Technical Education building the nation’s workforce. There is no other profession that touches every person that supports our country, and as teachers we have the power to support these young minds and prepare them for an unknown future. We provide them with the skills to problem solve, evaluate, and think critically in many different situations. I will leave you with a story about a young man with special needs. Ray walked into my classroom as a freshman needing an aide for all of his classes. Everyone told me what Ray couldn’t do. I told them he can make the decision for himself about what he could or couldn’t do. Mine was the first class where Ray was allowed to try and possibly fail, but also have the chance to succeed on his own. I’m proud to say that as a Junior he now has no aide in my very technical hands on class! He will be in the highest level of our Automotive Program next year. This was only because I took the time and built a relationship with him, I allowed him to say and demonstrate what he could do. Kids are our future and for many of those kids, Career and Technical Education is the edge to our puzzle of education that brings everything together. Steve Elza was the 2015 Illinois Teacher of the Year. 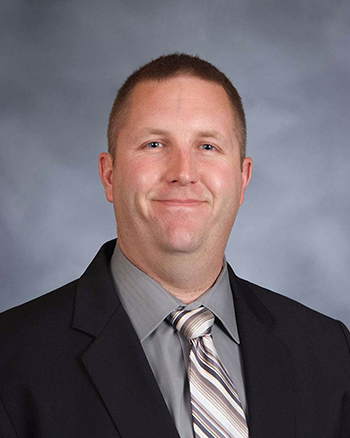 He is an instructor of Applied Technology at William Fremd Township High School in District 211.